Welcome to the official site of Yakub Kolas National Academic Drama Theatre! Our theatre exists in Vitebsk for 90 years. The theatre is located in a historical place called Alherd Hill. The audience of our city as well as its guests have a wonderful chance to enjoy the performances in the Belarusian language. The repertoire of the theatre is made up of plays of different genres, from drama to the sweet irony of modern parables and tragic grotesque. 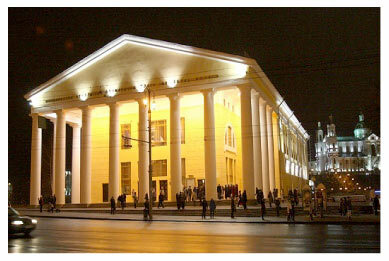 The theatre stages both Belarusian and foreign authors, classic as well as contemporary plays. There are three venues at the theatre: the big stage, theater room and a chamber experimental stage. School Theatre festival is held yearly at the theatre. Kolas artists participate actively in tours and festivals and are always open to new creative ideas and projects. Welcome to the site and come to see our performances!